Bitcoin mixing solutions came into the market as a response to the need for stronger anonymization. Not only have they become an indispensable part of the cryptocurrency eco-system but also central to its evolution. In this article we invite you to review the history of a close to a decade-long fight for financial privacy, examine the present and look into the future of anonymization technologies. In 2010-2011, all those concerned with Bitcoin’s pseudo anonymity members of the crypto community started looking for a solution to the major architectural flaw. That is when the first mixers emerged. Architecture wise, the pioneering solutions were fairly simple – they would offer a wallet for clients to send their money to, where their coins got mixed and later randomly distributed among users. The first mixers were tasked to break links among addresses and they were well capable of doing just so. It took one blockchain monitoring platform, namely Blockchain.info (now blockchain.com), to start publishing reports on crypto currency transactions when the market saw a game-changer. Through taint analysis algorithms, blockchain.info was able to accumulate data on funds movements, their destination and amounts for each chosen address, all of this back and forth in time with a required level of details. It was a wake-up call for a lot of crypto holders, prompting the competition among mixing platforms to gain the ground. The turning point occurred when the darknet market Silk Road was shut down. Its contribution to the popularity of Bitcoin cannot be understated as, unlike anywhere else before, all transactions had been conducted in Bitcoin and buyers/sellers remained anonymous… until the shutdown of the platform by FBI followed by the complete deanonymization and arrests of participants. The anonymity issue drew the attention of the leading universities’ research groups, including those of Harvard, and crypto enthusiasts worldwide. Through their findings they fueled the growth of interest in the cryptocurrency world and blockchain analytics. At the time, taint analysis had been in common use whilst volume analysis just entered the game. In a nutshell, the concept of the latter can be explained as a way of establishing a link to a certain transaction by learning its input amount and monitoring blockchain during a period of time to map the output transaction of a similar volume. Considering a much lower amount of transactions in the network overall back then, the volume analysis produced pretty accurate surveillance data and was especially efficient with strikingly bigger transaction amounts. Centralized mixing services started on the path of strengthening their ammunition by baking into their systems a few new features, like payout delay, random fee, and breaking the payout sum into parts. The architecture of such tumblers remained simple and featured several pots for mixing, clients’ money entering one pot and leaving another one. However, when used on a regular basis, those mixers could fail to deliver a promise of not sending the exact same money back to the client. As a stopgap, mixers resorted to the incorporation of mixing codes. Upon each mixing request, a user would get a unique mixing code that would taint their transaction and dial back the risk of getting the same coins. With time, the mixing codes would pile up and complicate the search of the last one in chain. Moreover, the mixing services would have to store clients’ transaction history for further identification which presented a violation of basic anonymity protocols. In 2013 Greg Maxwell came up with an absolutely brilliant idea of CoinJoin which he broke down for bitcointalkers in his thread. He suggested that all those concerned with Bitcoin’s lack of anonymity should use peer-based mixing. They would need to invite their trusted parties to go online and conduct one single transaction, where their coins would be simply untraceable among others. To elaborate, each party would make an identical deposit of say 1 BTC, their coins would get mixed and it was infeasible to tell whose money eventually ended up where. One input, one output - simply genius. The approach would neuter taint analysis, but was not flawless. First, there was no telling whether all parties were using clean money or not. Second, all participants would have to be online at the same time and send in an identical amount of coins. Third, there were no smart contracts to verify transactions. The CoinJoin transaction could not be added to blockchain until all parties signed their transactions. The idea of trustless mixing by Greg Maxwell lives on and has been adopted by multiple products like SharedCoins, Dark Wallet, CoinShuffle, CoinShuffle++, ShufflePuff, JoinMarket, Shared Coin created by blockchain.info, and others. Some vanished from the market, some continue their business. CoinJoin clearly had a liquidity problem which was successfully tackled by JoinMarket. The platform debuted its maker-taker concept where makers were the co-payees providing liquidity, and takers were the ones looking for trusted parties to cleanse their money in a CoinJoin transaction. The market-makers offered their coins for a fee which, if takers asked for stronger anonymity and required more makers to join them, could go up considerably. In 2016, Neutrino, a blockchain monitoring service, published a report showing how JoinMarket transactions had been back-traced and analyzed by geography, transactions amounts, cryptocurrency exchanges used by JoinMarket clients, and a few more parameters. That research would send the message to the cryptocurrency world saying there was no escaping the Big Brother for anyone on the network. 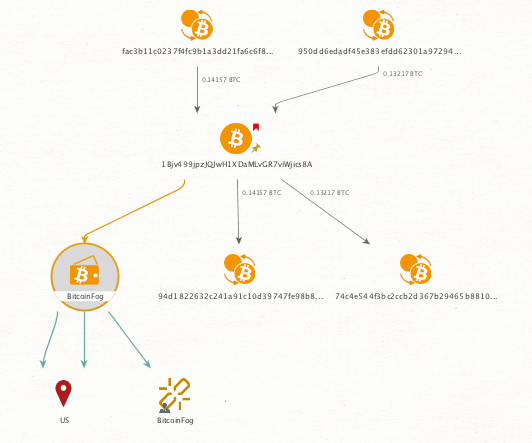 In their report on illicit flows into digital currency services during 2013-2016, Elliptic, a blockchain analysis company fighting illicit activity in the crypto currency network, brought up gambling platforms and crypto currency stock exchanges among other mixing tools. The mention is not occasional as both offer unmatched liquidity. Gambling sites and stock exchanges are reported to have a multi-million-dollar turnover and, that being said, the risk of getting the same coins back is close to zero. With growing government pressure, gambling services and stock exchanges had to impose a few counter-measures against their use by mixing platforms. AML (Anti Money Laundering) and KYC (Know Your Client) compliant stock exchanges started forcing their clients to fully verify themselves through their ID photos or even bank statement. On top of that, crypto currency exchanges would reserve one and the same forward-to address for each user and store logs. At that point, some mixers which had registered multiple accounts to buy transactions from stock exchanges encountered a ban while others had their money blocked. The development of such wallets so far has been a successful endeavor for currencies like Monero and Dash but never for Bitcoin. Its delicate design won’t stand major protocol alterations - any serious interference can mess things up and trigger unwanted, if not disastrous consequences for blockchain. As long as Bitcoin remains the most capital-intensive and #1 cryptocurrency in circulation, bitcoiners have to live with the fact of its excessive financial openness. Decentralized wallets haven’t yet fixed all anonymization-related problems. As we could witness in the story of JoinMarket transactions being disclosed, any newcomer who brings their product to the market, however brilliant their tech might be, narrows down the amount of data for analysis and facilitates the investigative work by blockchain surveillance companies. More and more cryptocurrency stock exchanges chose to collaborate with ‘cryptocurrency compliance’ organizations so as to get regulation agencies off their backs. To comply with laws, they deployed scoring algorithms to evaluate the origin and potential risk of letting those coins in. For better understanding you might want to check out a risk report by the AML and KYC compliant company Coinfirm. Scoring systems have been taught to spot and deanonymize the majority of classical mixers and mark them in reports. Eventually it got much riskier for crypto users to place their trust in a tumbling service that, if identified by stock exchanges’ scoring algorithms, could get them in trouble. Having reviewed the past and pondered the present, we finally can do a little bit of crystal-gazing and look into the future of anonymization techniques. Providers of mixing solutions that hope to become a real asset in the cryptocurrency community must secure a continuous inflow of coins with clean origin in order for their clients’ money to pass the scoring. This can be achieved through either mining or buying transactions from stock exchanges. Apparently, the latter have no intention of dealing with tumblers. Neither do miners. The one and only model that can work around multiple bottlenecks is the one where mixers purchase transactions from independent traders who sell on stock exchanges, verify them (this is no longer an issue with services like Walletexplorer), use them in their mixing pools and top up their reserves on an ongoing basis. Then and only then clients with legal intentions will stop getting money with dark history and falling victims to risk scoring and deanonymization at the fiat gateway. Blockchain intelligence continues to collect data and connect the dots, their tech becoming a market standard. Meanwhile, Bitcoin’s anonymity seems like a notion from a distant past. We have no clear idea of how fast deanonymization technologies are evolving. But we have all reasons to believe that the future where any crypto holder willing to exchange coins at centralised or semi-decentralized platforms will have each and every transaction scrutinized and sanctioned or unauthorized is not that remote. Mixer.money, an anonymization platform powering a network of mixing solutions, has stepped up to the plate and started investing their resources into anonymity-enhancing technologies that clients really(!) need now. With the blockchain surveillance industry’s technological leap, you have to be pre-emptive. Our minds are currently occupied with the Lightning network protocol, smart contract tech like atomic swaps and a few more. We will take our time to look into new integration options. The bottom line is we have to be absolutely sure they will be instrumental in helping us deliver unmatched anonymization tools and do our clients no harm.